Come out to sample and vote for your favorite chili prepared by eight local chefs from Barbara’s on the Bay, Crow Vineyard & Winery, Happy Chicken Bakery, Kitty Knight, Luisa’s, Molly’s Restaurant, The Pearl on Main, and Smoke Rattle and Roll. There will be a $10.00 entry fee for the event with cash voting at each chili station. Tickets can be purchased online or on-site at the event. Make sure to bring CASH, $1, $5, $20, or whatever you wish to vote for your favorite chili! The Animal Care Shelter for Kent County will also have various items for raffle and silent auction. All proceeds from the entry fee, voting, and auction items will benefit the Animal Care Shelter for Kent County, with their fundraising goal of $5,000 to go towards the new shelter. Come ready with cash to support our local animals in need! 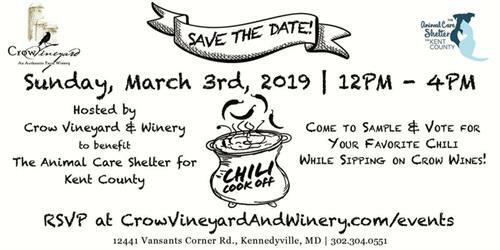 For more information please email info@crowvineyard.com or call 302-304-0551.